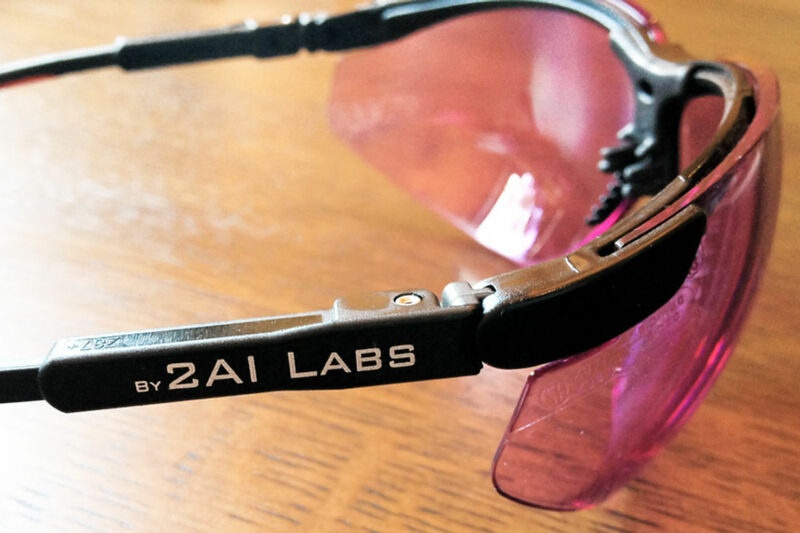 The Creativity Post | The First Eyewear Designed for Seeing…People. 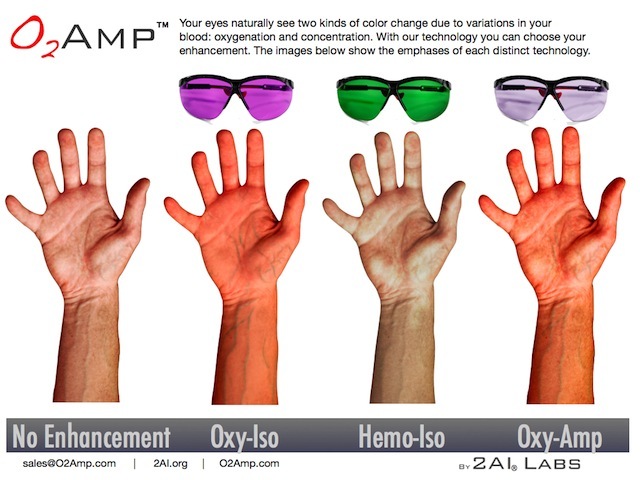 The O2Amp amplifies perception of emotions, moods and health. Really. We at 2AI Labs are excited to have received from our manufacturer our first shipment of O2Amps, our patented eyewear that amplifies one’s view of the emotions and health visible in the color and pallor of other people’s skin. 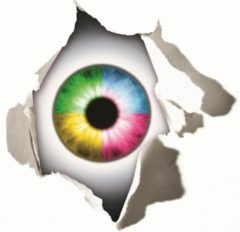 The technology comes out of my research while at Caltech on the evolution of color vision in primates, where I provided evidence that color vision evolved to sense oxygenation modulations in the hemoglobin under the skin. 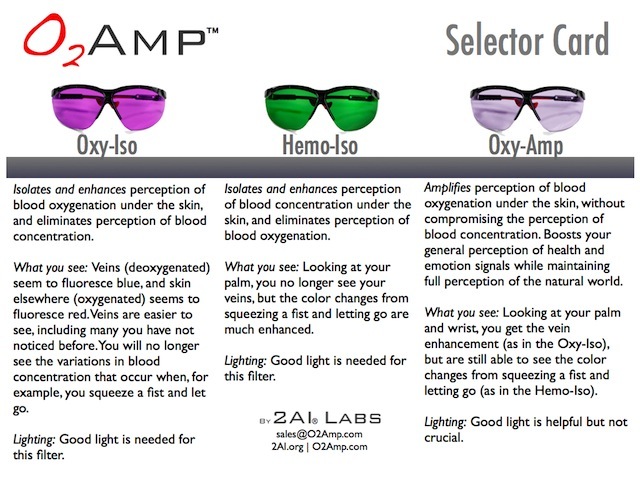 Once one understands the connection between our color vision and blood physiology, it’s possible to build filters that further amplify our perception of the blood and the signals it provides. Because color vision evolved for everyday wear, so to speak, one of our largest markets is for everyday-wear sunglasses, to enhance one’s perception of the emotion, mood and health signals we evolved to detect with our color vision. For example, typical sunglasses shade the world but also end up shading one’s connections to other people; this is exemplified by the way people tip up their sunglasses to get a better look at someone. Our technology shades the world but notthe social; for the O2Amps, one sees other people better by keeping them on, rather than tipping them up. There are also applications in security, sports, poker, and dating. – (iii) a general clinical enhancer, or oxygenation-amplifier, that combines the best features of the first two; it eliminates neither signal (i.e., it retains perception of both variation in Hemoglobin oxygenation and concentration), and only amplifies perception of oxygenation. We’ve received great interest from medical professionals interested in trying out the O2Amp, and we’re moving now to get them in hospitals and among clinical staff everywhere. Note that good light is needed for the technology, by which we mean outdoor lighting or a head lamp. MSNBC, Sciencebase, Tech Rev, Betabeat, PopSci, ExameInformatica, Smithsonian,LiveScience/Yahoo, WIRED, NZ Herald, Investors, DesignBoom, Mobiledia, Discovery,PSFK, Neoteo, Earthsky, Good, Wissenundkonzepte, Stuff, Forbes, Actualidad, Geek,Gizmodo, PSFK, Neatorama, TIME, Oprah, BBC. Mark Changizi is Director of Human Cognition at 2AI, and the author of Harnessed: How Language and Music Mimicked Nature and Transformed Ape to Man and The Vision Revolution. He is finishing up his new book, HUMAN 3.0, a novel about our human future.